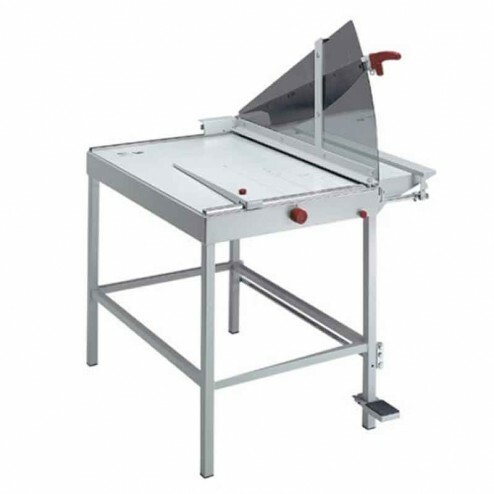 The MBM 1080 Triumph Ideal 31 1/2" Large Format Floor Model Lever Style Guillotine Trimmer saves time and money. Solingen steel blade set may be resharpened special wide-angle blade cuts heavy materials such as matteboard, plastic, and metal foil transparent Lexan safety guard blade lock foot pedal for positive clamping precision side guides scaled in inches and metric system adjustable back gauge front gauge is adjustable using a calibrated rotary knob with fine adjustment scale, lockable in every position narrow-strip cutting device fold-down extension table provides support for large cutting jobs standard paper sizes indicated on table solid cast aluminum blade mounting bracket with double pivot bearings for blade axle all-metal construction. Cutting length - 31 1/2"
Table size (D x W)31 1/2" x 23 7/8"
Dimensions (D x W x H): 42 1/2" x 26 1/4" x 48"